Prefabricated steel buildings are exceptionally durable. For some, they offer unmatched strength and quality. Our client, a premier provider of steel building systems, builds durable solutions and we knew we could help make them even better. Their solutions have advantages over other traditional post and beam materials, specifically as they relate to fierce winds, heavy snow loads and extreme storm conditions and hurricanes. These steel buildings are ideal for any home owner who is looking for space and protection. Easy assembly and installation are key. Needed to improve the labour costs of our client and increase installer and customer satisfaction by identifying opportunities to improve the overall assembly process. Needed a new hardware design that gripped onto the material, locked into place and prevented rotation. 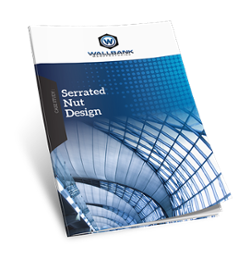 Complete the form on the right to download your copy of “Serrated Nut Design Case Study” to find out how Wallbank helped create a more efficient and effective hardware design.